Dhanalakshmi has been on Anti-Retroviral therapy (ART) for 12 years and still finds it difficult to accept the fact that both her children are HIV positive and are on ART. After her husband’s death, her mother-in-law introduced Dhanalakshmi to Mithra’s staff when Dhanalakshmi was finding it difficult to make ends meet. 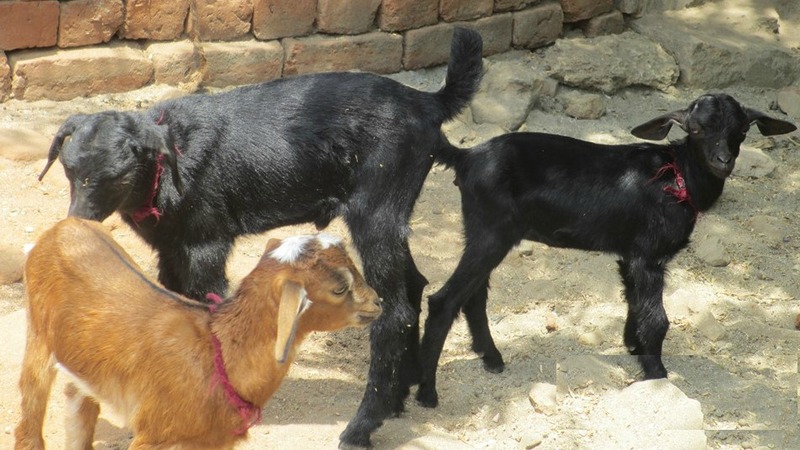 Mithra’s loan of Rs 10,000 (£100) enabled Dhanalakshmi to buy three goat kids two months ago. These goats require low maintenance and could fetch a price as high as Rs 5000 (£50) each on attaining adulthood. Mithra also helped Dhanalakshmi to register with the Mahatma Gandhi Rural Employment Guarantee Act (MNREGA) scheme, which guarantees a mimimum of 100 days of work per year. Under this scheme, she earns approximately Rs 100 – 150 (£1- 2) per day digging canals, cleaning ponds, etc. At present she is able to get work for one week in a month, so earns approximately Rs1050 from MNREGA plus an additional Rs1500 as an agricultural labour. A total income of Rs 2500 (£25) per month plus a widow pension of Rs 1000 (£10). Supported by Jeevika and Mithra Foundation, Dhanalakshmi has managed to turn her life around. But there are many more women living with HIV/AIDS in rural India who still need our help. For more information on our projects please take a look at our current projects page.